Moving Average (MA) is one of the most widely used technical indicators and perhaps the most important as it forms the back-bone from which many other technical indicators are calculated. A moving average is a trend-following indicator which shows at any point in time the security’s average closing price over a preceding specified period of time. On timetotrade's charts , the default time period over which the moving average is calculated is set to 12, however this can be adjusted depending on your trading strategy and objectives. For example, a long term investor might use long period moving averages (eg 50 – 200 periods) to identify the overall trend, a short term day trader would use shorter period moving averages (eg 5 - 20 periods) to trade shorter term trends, whilst a medium term swing or trend trader might opt for moving averages of between 20 to 50 periods. If the moving average is increasing, it shows that prices are, on average increasing and the trend is bullish. If the moving average is falling, it shows that prices are, on average falling and the trend is bearish. The moving average is usually displayed as an overlay on the price chart. Using the 12 period default by way of example: whenever price is above the moving average it shows that the price is higher than the average price has been over the preceding 12 periods (this generally occurs when price is in an uptrend and is considered bullish). If price is below the moving average, it shows that the price is lower than the average has been over the preceding 12 periods (this generally occurs when price is in a downward trend and is considered bearish). When the price crosses above or falls below its moving average, it can indicate a change in trend. Such crossovers are frequently used as trading signals, with price crossing above its moving average considered a bullish signal and price crossing below its moving average considered a bearish sell signal. It is important to understand that the moving average is calculated based on past prices; therefore signals generated by moving averages do lag and are always a step behind the market. The longer the moving average period used, the greater the lag. Shorter period moving averages (e.g. 12) will move very closely with price, and react more quickly to changes in trend. Longer term moving averages (eg 200) are slower to react as they are based on the average of many more periods of price data. With this in mind, technical analysts often combine a short period moving average (eg 10) with a longer period moving average (eg 50) on the same chart, using the shorter period moving average as a ‘signal line’. When the shorter period MA crosses the longer period MA, this is considered a bullish ‘buy’ signal. On the other hand, the shorter MA crossing below the longer term MA, is considered a bearish sell signal. Exponential Moving Averages are also frequently used instead of simple moving averages, in order to reduce the time lag associated with a simple moving average. An exponential moving average puts more weight on recent data and less weight on past data, making the indicator react slightly more quickly to changes in trend than the simple moving average discussed above. Moving averages are very useful in helping to identify the trend, but as they a lagging indicator, are always a little late at signalling exact market bottoms and tops. It is also worth bearing in mind that whilst moving averages work well in upwards or downwards trending markets, they will generate many false signals in a sideways range bound market. 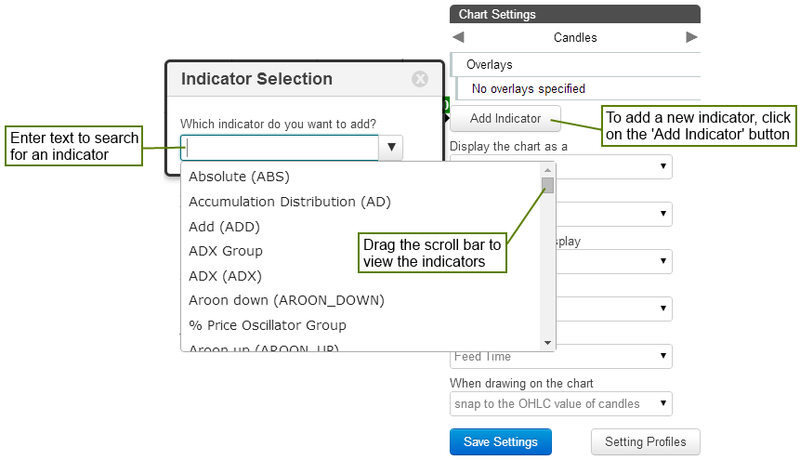 After adding the Moving Average indicator, within the chart settings, click on it to set the parameters and change colours.